Candace Savage and her husband, Keith Bell, were on a busman’s holiday when they first visited Eastend in southwest Saskatchewan, in 2000. Candace was researching a book, and they had sightseeing plans. But their van kept breaking down, forcing them to stay in one place, and the land around Eastend drew them in, urging Candace to explore its secrets. Candace and Keith returned the following year and purchased a house in Eastend. Candace would spend the next 11 years thinking and writing a book about her experiences. A Geography of Blood is now in print and is an intimate exploration of the interrelationship between humans and nature. A Geography of Blood: Unearthing Memory from a Prairie Landscape should be required reading for Western Canadians. We need to understand our past in order to ensure a future that is in harmony with all the creatures who share this prairie home. 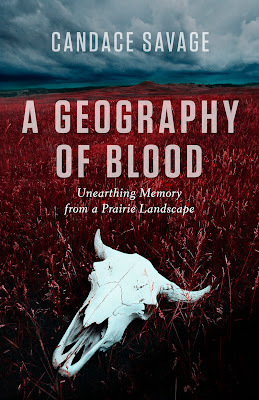 Candace will be reading from A Geography of Blood at McNally Robinson Booksellers on Thursday, September 20 at 7 pm.